Barriers to Cloud Adoption: Legitimate or Not? Security, loss of control and new compliance issues are among some of the reasons why enterprises are hesitant to move their data and applications to cloud-based architectures; but are these inhibitors legitimate or overblown? 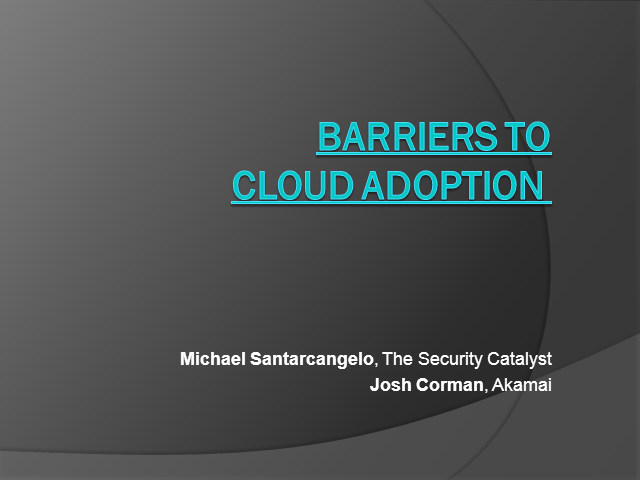 Michael Santarcangelo and Josh Corman will share their thoughts on the different inhibitors to the cloud and share their expertise on how to approach cloud adoption and how to take advantage of the unique benefits of the cloud. Title: Barriers to Cloud Adoption: Legitimate or Not?